Here we are in a New Year and all new projects for the hop. Today Robin Lane will be hosting from Create a Latte, with the New Year, "Anything Goes" would be a great way to start. Do you like paper crafts, making cookies, crocheting or making pillows? Really anything goes for more fun and inspiration for us ladies who love to bake and do other things then paper crafts! Today I have prepared this for you. I am in love with Shaped Cards! I used the Over the Hedge for You file from Kadoodle Bug Designs. I have made a few different Hedgehog cards recently but I think this one is my favorite! He fits in to an A2 size envelope. and recollections for the colored card stock. I also used some pattern paper scraps from I think it was the My Girl 6 by 6 paper pad for his hearts. followed up with some doodling for his eyes. I used tombo mono multi glue, atg tape and foam tape. I donno bout you by I hope to be posting more and on a regular schedule! Come back on monday to see if got my bum in gear lol! Help us by making our teams resolution to gain followers and do a fantastic job for you that won't disappoint. We have a hop every first Sunday of the month, and we will bring some kind of inspiring project with us! Thank you for stopping by don't forget to hop the whole hop to see what we have going for you! Blog lovin' can also win you some blog candy! 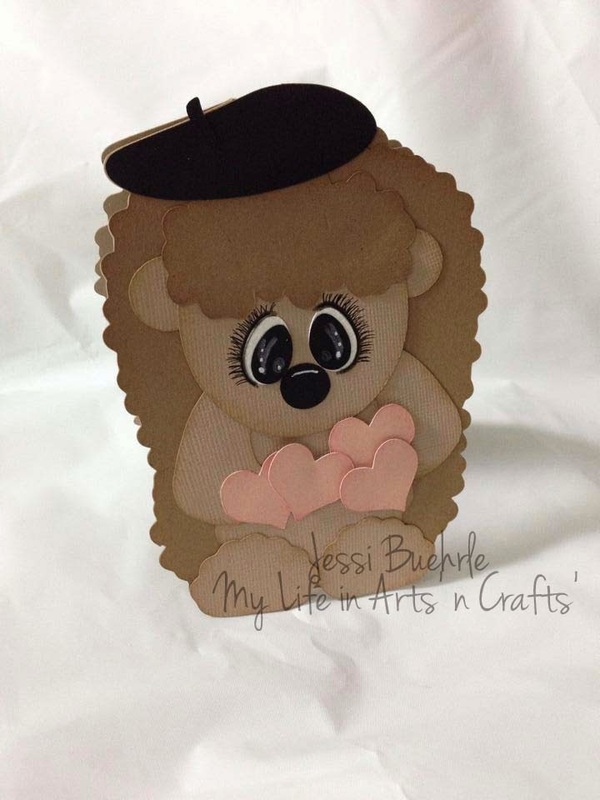 Beary cute shaped card! Thanks for jumping back in on the hop! Sweet card, love the shaped ones! Such a cute little critter. Awe Jessi he is just darling!!! Love that he is holding all of those hearts!!! What a cute shaped card! Love the hearts! So cute!! I love shape cards! Super cute card I love that little hedgehog!! I love your card, it's so cute. Thanks so much for sharing. What a super cute bear card. Thanks for sharing. Already a follower. This is a super cute card. Thank you for sharing.